Starting with … shagging batting practice flies. Apparently, John Stanton, chairman and managing partner of the Seattle Mariners, has been remiss in this area – thus requiring, uh, special assistance. Meanwhile, across Lake Washington on Friday, the Seattle Seahawks cut loose defensive end Cliff Avril in the ongoing purge of franchise beloveds that also has swept away Michael Bennett and Richard Sherman. Earl Thomas continues to fulfill his current role as trade chum in absentia. So you see how this works. There are those things you can characterize as mercy, grace or the saving of face. The twisting of spines into pretzels to accommodate old friends or figures of gravitas. And then there is the cold slap that normally accompanies any check of the calendar. On the pro sports employer humanity continuum, the NFL is Donald Trump and MLB is Mr. Rogers. Or not MLB, really. The Mariners. Lords of the Long Goodbye, purveyors of the warmest wishes. This has not always been the case, of course – the original trades of Randy Johnson and Ken Griffey Jr. were Awkward R Us. But the M’s have put us through enough bobblehead nights, statues, jersey retirements, street renamings and Edgar’s Cantinas in the last decade – with a decidedly small pool of past dignitaries – to assure us they have the hang of this now. And that’s OK. Preferable, even. Like the bumper sticker says: Wag more, bark less. Unique player – no argument there, given his Hall of Fame career, including 10 200-hit seasons in Seattle. Unique man. Unique situation. Unique solution. Unique timing. Unique job description. Well, not unique. Inscrutable. It is not at all clear what Ichiro will do in his new role, other than not play in any more games this season – and not retire, either. The man himself thinks he can play until he’s 50, even though his nine lonesome singles this season insist he was very much the courtesy/emergency acquisition everyone saw him to be this spring. That decision made an awkward situation inevitable when Seattle’s young outfielders returned to health, and it’s likely some executive meddling and contract stipulations made it drag on at least a week longer than it needed to. Now he’ll suit up for BP but can’t be in the dugout during the game. The M’s said he’ll be there to advise the field and high performance staffs and the front office, assist with some coaching and “provide mentorship” – on a team that has plenty. Ichiro’s observation station is a TV near the indoor batting cage and workout area, where he spent a fair amount of time anyway on the days he didn’t start. Which is a pretty good tell that he plans to be in Peoria come February 2019. He’ll need to in order to get ready for the M’s season-opening two-game series against Oakland in Tokyo. Ichiro being a part of that package is no less of a lock than Rick Rizzs bringing us the happy totals. The M’s didn’t completely ace the timing. This all came down a day before the Angels came to town. So Ichiro had to watch on TV as Albert Pujols joined him in the 3,000-hit club, and there will be no pitcher-hitter meeting of two-way Japanese phenom Shohei Ohtani – likely to pitch Sunday – and the 44-year-old legend. That was a disappointment, though they did chat in the outfield during batting practice. 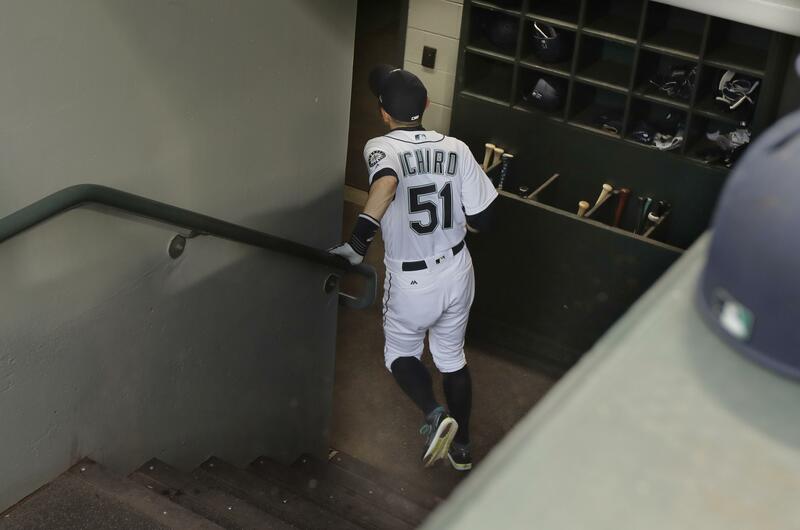 Ichiro’s impact in Seattle was undeniable – if with just one scant foray into the postseason. His new role may be a contrivance; it seems to be more about him continuing to train. But maybe that determination will be a good example. And the chairman. He needs special assistance, too. Published: May 4, 2018, 10:38 p.m. Updated: May 5, 2018, 11:10 a.m.